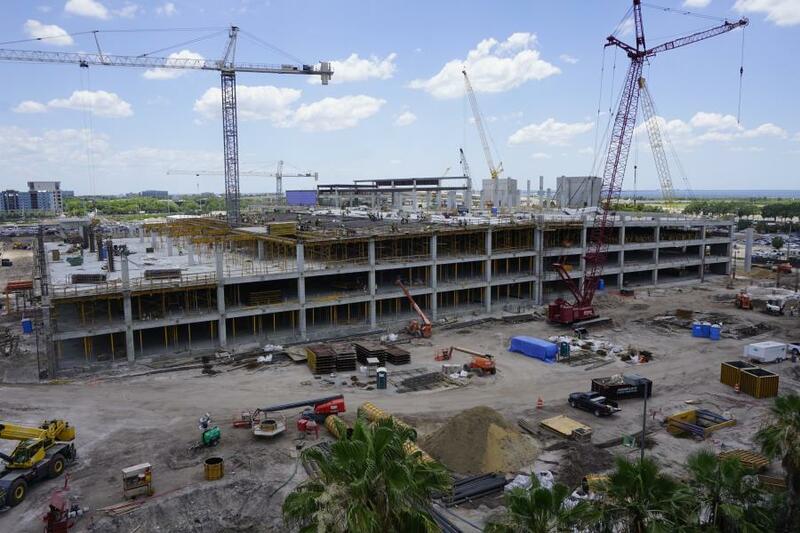 As part of the largest renovation to Tampa International Airport since it opened in 1971, construction crews in Florida are continuing work on Phase I of a massive master plan expansion. At an estimated cost of $971 million, the first phase includes a 2.6 million sq.-ft. rental car center, a 1.4-mi. automated people mover, a main terminal/concessions overhaul and smaller support projects. The work is part of a more than $2 billion, long-term renovation and expansion that will improve the passenger experience over the next 10 years. It also will allow the airport to ultimately double its passenger traffic to 34 million. For staff, anticipating potential customer issues is crucial. During the expansion, areas within the main terminal and surrounding roadways have been affected. Valentine noted that travelers don't seem overly concerned about closures, delays and other inconveniences. For airport officials, keeping visitors out of harm's way is crucial. “The airport has a robust safety program, in addition to safety programs by each of our design-builders,” said Valentine. “We have quite a bit of work around passengers, for example, in our main terminal and on our roadways. Planning for future generations of travelers was another major consideration. “We expect our passenger numbers to continue to grow into the future and we want to be ready for them. When we started this project, we were at our near capacity on many of our roadways, curbsides and in our main terminal. Since then, our passenger numbers have increased, and we are expecting to hit record passenger numbers this year. The Tampa Bay region is growing as a whole, and it's important that the airport, a major economic engine, continues to grow with it,” said Valentine. The 270,000 sq. ft. undergoing renovations on the third floor of the main terminal is the equivalent of four-and-a-half football fields. More than 55,000 sq. ft. will be added to the terminal, including more than 23,000 sq. ft. for new outdoor terraces. The project includes the renovation of two dozen of the airport's elevators, and the replacement of 1,112 linear feet of escalators. Crews also are placing approximately 114,000 sq. ft. of new tile flooring. The rental car facility will be large enough to hold more than 5,300 vehicles at a time. The center features eight 25,000 gal. fuel tanks and 30 car washing stations At its peak, it can handle 1,541 rentals and 1,650 returns per hour. An estimated 200,000 cu. yds. of concrete, which amounts to 25,000 truckloads, is required to build the automated people mover and rental car center. The facilities will be built with 14,000 tons of steel, including 9,000 tons of rebar and 5,000 tons of structural steel. 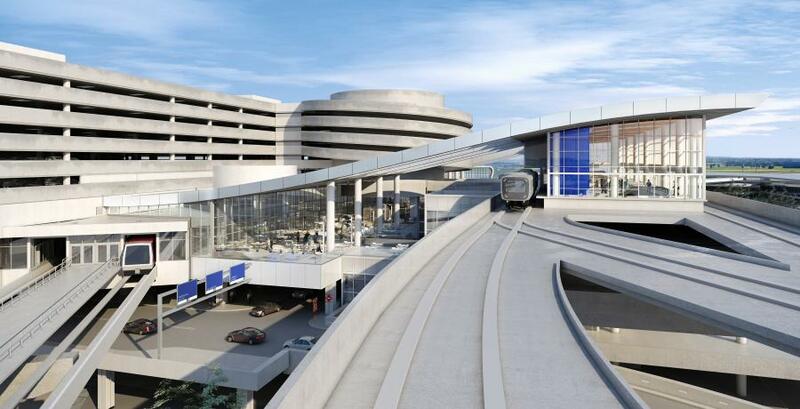 The automated people mover features 7,300 ft. of track on its way from the main terminal to the rental car center. A typical trip is expected to take about four minutes. The initial people mover is designed to carry 2,700 passengers per hour, although it could handle up to 6,500 per hour in the future. In late 2011, Tampa International Airport officials began the process of updating the master plan for the airport's 3,300-acre campus. The final plan, approved in 2013, outlines three phases of expansion and allows a “build as demand dictates” approach to growth, with phases based on passenger volume. The project is expected to create or save nearly 9,000 construction-related jobs. To date, more than four million total hours have been worked on Phase I. Understandably, coordinating all the work taking place is no small task, and staying on course is critical. “The project baseline schedule was very compressed from day one,” said Tom Skinner, project director, TIA ConRAC & APM Infrastructure Projects. “The overall schedule allowed 10 months to clear and relocate the more than 40-acre ConRAC site and the 1.4 miles APM Guideway alignment of existing improvements, followed by 12 months to construct the four-level, cast-in-place 2.6 million sq.-ft. ConRAC structure and the cast-in-place APM Guideway. We have the remaining 12 months to complete the exterior enclosures and interior finishes for the four APM stations and the ConRAC CSB/Cores/QTA. The rental car center is the second largest aspect of the early activity on site. Also included in Phase 1 work is the construction of 69 new shops and restaurants in the main terminal and at the airsides, as well as the renovation of the main terminal transfer level and various ancillary support projects. 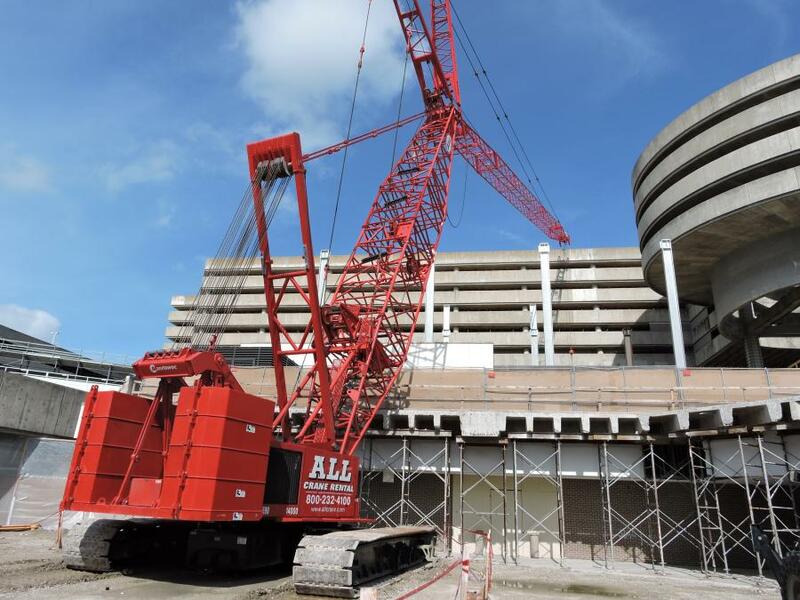 Amid the assortment of cranes, lifts and other heavy machinery on site, crews are incorporating a variety of materials during Phase I work, including concrete curbed asphalt pavement with some CIP paving, cast-in-place concrete and structural steel structures and foundations, glazed aluminum curtainwall, metal panel, precast, CMU exterior enclosures, metal standing seam roofs, tile and terrazzo flooring, metal ceilings, phenolic and resin wall panels, chillers and cooling towers. Approximately 250,000 cu. yds. of dirt will be moved during Phase I construction. The confirmation of the location of all the existing UG utilities and improvements, as well as the ConRAC and APM Guideway structures is considered the most time-consuming part of the work. In mid-July, the airport made way for a dozen train cars designed for the new SkyConnect. All 12 cars, as well as a maintenance vehicle, were placed onto the guideway by crane. 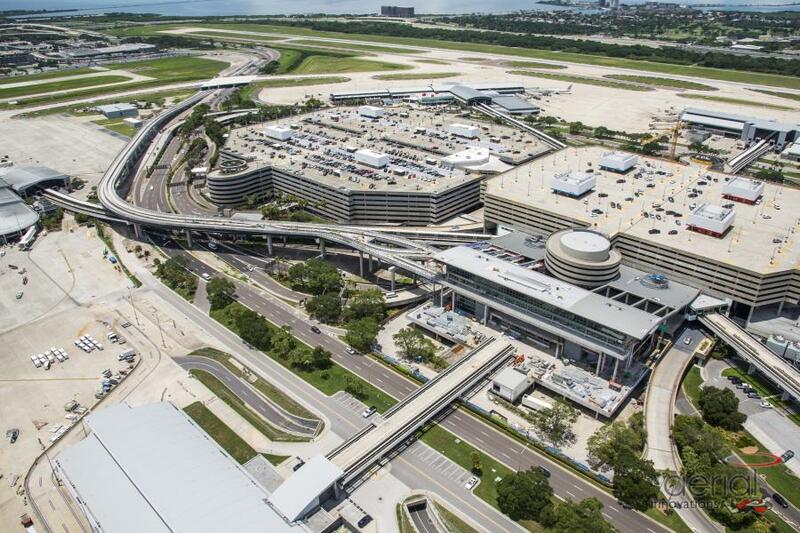 The SkyConnect will connect TPA's main terminal to the economy garage and new rental car center. The system will open to the public in early 2018, after extensive testing. Officials marked the arrival of the SkyConnect cars with an event at Port Tampa Bay. Speakers included airport and port officials, along with Florida Gov. Rick Scott, Tampa Mayor Bob Buckhorn, Japan Consul General Ken Okaniwa and Aviation Authority Chairman Robert Watkins. Gov. Scott said Florida recently became the second highest state in the country for total airline passenger traffic, partly because of a $1 billion investment in state funding to the airports, including TPA. Mitsubishi Heavy Industries built the SkyConnect cars at its factory in Japan. Each train car cost approximately $1.9 million and is designed to last 25 years. The SkyConnect trip from the main terminal to the rental car center will include a stop at the economy parking garage. The facility will include kiosks for obtaining boarding passes and checking bags. The car exteriors feature birds commonly found in the Tampa Bay region. The airport team worked with the Audubon Society to select the images. A second phase of the expansion project includes express curbside drop-off for passengers without checked bags, along with the commercial development of 17 acres of airport property. The centerpiece of the next phase is the commercial development, which includes plans for up to two hotels, an eight-story, 240,000-sq.-ft. office building, a 20,000-sq.-ft. retail strip and a gas station with a convenience store. The gateway also includes a large atrium, pedestrian connections to area trails and commercial curb sides for transit and ground transportation. Phase II also includes widening the George Bean Parkway, which is the main artery in and out of the airport, as well as adding a new exit lane and a new airport energy plant. Site preparation for the development is scheduled to start in mid-2018, with construction launching in 2019, pending board approvals. The project will run until 2023. A $798 million Phase III is expected to begin in 2023, and includes a new Airside D with 16 gates capable of handling both domestic and international flights. This phase would finish in 2026. Tampa International Airport is located six miles west of downtown Tampa, in Hillsborough County, and is publicly owned by Hillsborough County Aviation Authority. Recognized for its architecture and Landside/Airside design of a central terminal connected by people movers to satellite air terminals and gates, the airport was known as Drew Field Municipal Airport until 1952. The airport is served by more than twenty major air carrier airlines, four regional airlines and two air cargo carriers. It currently serves 85 non-stop destinations throughout North America, Central America, the Caribbean and Europe. Tampa International is one of only two airports in the United States to host regularly scheduled charters to four Cuban cities, including Havana and Santa Clara. The airport handled nearly 19 million passengers in 2016, making it among the 30 busiest airports by passenger movements in North America.